Overuse injuries – these are those that are usually more common in people who are active in sports and are due to repetitive use causing damage to the structures involved such as tennis elbow, swimmer’s shoulder, and etcetera. It is estimated that over 1 million young people participate in team sports. 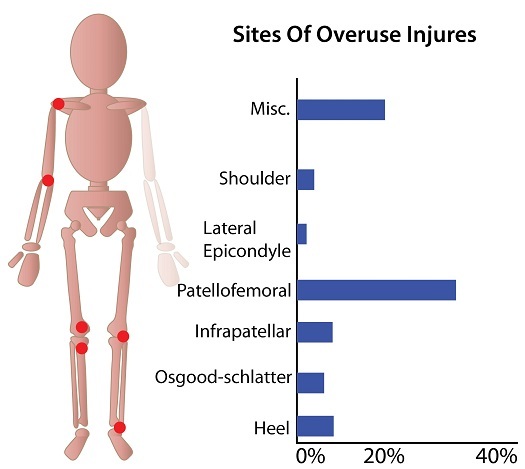 Overall estimates of overuse injuries range from 45.9% to 54% and the prevalence of overuse injury varies by different sports ranging from 37% (skiing and handball) to 68% (running). Most injuries experienced in pediatric sports are related to overuse of the joints and muscles. There are several risk factors of overuse injury. Prior injury is a strong predictor of future overuse injury. Factors such as malalignment (flatfoot, high-arched foot, etcetera) and joint hypermobility are also associated with overuse injuries. Amenorrhea (absence of menstruation) is a significant factor for overuse injuries. Increased training time also increases the risk of overuse injury. Other factors would include poor fitting equipment and overscheduling (multiple competitive events that occur the same day or over several consecutive days). There might also be discomfort or pain that is persistent during periods of rest. The diagnosis can be made using the patient’s history and examination of the patient. Imaging such as X-rays, computed tomography (CT), magnetic resonance imaging (MRI) and ultrasound can also be used to aid or rule out the diagnosis. The general treatment for an overuse injury includes rest (cutting back on the intensity, duration and frequency of an activity), adopting cross-training to maintain fitness levels and skill set, learning the proper techniques to prevent future injury, performing warm-up activities before and after activity, using ice to aid healing and decrease damage, using analgesics for pain relief and decrease inflammation and going for physical therapy to aid healing. Other treatments would be specific for the type of overuse injury that is affecting the patient. Surgery may also be needed if there is no improvement after conservative measures. Prevention of overuse injury includes limiting participation time in sports and schedule rest appropriate to the sport, athletes age, growth rate, readiness and injury history. Monitoring of training workload during the adolescent growth spurt is also recommended as injury risk seems to be greater during this phase. Using the proper equipment per size, age and technique of the athlete can also help to reduce the risk of injury. To reduce the risk of burnout, it would be best to place an emphasis on skill development rather than competition and winning. Sports professionals are also recommended to undergo a physical examination before beginning a new sport or before the start of a new season. It is best to participate in one team of the same sport per season to reduce the risk of overuse injury. They are encouraged to take 2-3 non-consecutive months off from a specific sport if they participate in a single event year-round. Burnout or overtraining syndrome is well described in adults but not in youth. It can be defined as a “series of psychological, physiologic and hormonal changes that result in decreased sports performance”. Common occurrences and signs of burnout include joint pain, muscle pain an elevated resting heart rate or decreased performance during sporting activitiesa. A sports professional may suffer a lack of enthusiasm about the sport or difficulty completing routine workouts when burnout occurs, therefore burnout should be recognized as a serious sequela of overtraining syndrome. Workouts should be kept interesting with age appropriate games and training. Focus on wellness and teaching athletes to know their bodies enough to look for cues to slow down or alter their training methods. The main aim in managing overuse injuries in athletes should be to determine the risk factors for injury and identifying steps on preventing the occurrence of these injuries. Although overuse injuries are often thought to be self-limiting, the recovery time can be lengthy, even more than acute injuries. Some overuse injuries may also negatively affect future participation and may result in long-term consequences. Prevention is essential and would include the participation of the athlete, parents or caregivers, coach or trainer and the healthcare provider. Sporting Goods Manufacturers Association Research/Sports Marketing Surveys USA. U.S. Trends in Team Sports Report, 2011. Jupiter, FL: Updated May 2011. DiFiori JP, Benjamin HJ, Brenner J, Gregory A, Jayanthi N, Landry GL, Luke A. Overuse injuries and burnout in youth sports: a position statement from the American medical society for sports medicine, Clin J Sport Med. 2014; 24:3-20.